Aardvarks look a bit like pigs, with rabbit-like ears and a kangaroo’s tail – yet they are related to none of these animals and are in fact said to be one of the closest living relatives to the African elephant! – The aardvark (Orycteropus afer) is the only species in its order. It is literally like no other animal on earth. – Aardvark is the first word in your English dictionary, however the name aardvark is not even English! 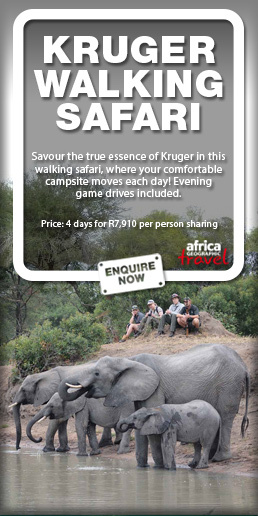 It comes from South Africa’s Afrikaans language and means ‘earth pig’ or ‘ground pig’. – The reason that they are so hard to spot is because aadvarks are nocturnal. After sunset, they leave their cool burrows and forage over many kilometres in grasslands and forests for their favourite food, termites, swinging their long nose from side to side to pick up the termites’ scent. – Aadvarks resemble various animals. The sparse hair on their bodies, their arched back and the appearance of a snout on the end of their long, narrow face earns them the resemblance of a pig. However they also have ears like a rabbit, webbed feet like a duck, claws like a bear and the tail of a kangaroo! – Their long tongue resembles that of an anteater, but they don’t belong in that family tree. – Aardvarks like to live in open grasslands or savannahs where the soil is soft and sandy. The temporary shelters aardvarks create do not go to waste as pythons, porcupines, other small mammals, and even birds will move in when the aardvark moves on. – Aardvarks are classified as omnivores, but they are far more specialised than that. They are truly insectivores, consuming termites and ants exclusively. When food is scarce and they are forced to aardvarks will eat other soft-bodied insects or wild melons. Aardvarks have an excellent sense of smell which they use to find food, and wonderful hearing which they use to keep from becoming food. – The aardvark’s entire body is built around eating termites. Their strong, shovel-shaped claws are hard enough to break through the outer crusts of termite mounds. Their 1 ½ foot long sticky tongue can extend down tunnels and chambers, lapping up the insects inside. When confronted with a particularly large mound, the aardvark will stand on its back legs, bracing itself with its thick, tapering tail, much as a kangaroo would. – The aardvark’s head is elongated and its snout has hairs and fleshy folds that can close, keeping dirt, dust and insects out. The aardvark has an unusual ability in that it can seal its nostrils to keep dust and insects from invading its snout. The aardvark’s skin is extremely tough, protecting it from the bites and stings of its prey. – While eating, the aardvark’s long, rabbit-like ears are rotated backwards, listening for any sign of approaching danger. – Aardvarks are not fast runners but they can quickly dig a defensive burrow. The aardvark’s tail is thick and strong and they will use it as a club. Their sharp claws are formidable weapons, and if caught in the open, the aardvark will roll on its back to engage all four feet in the fight. – Aardvarks are not social – they are solitary, nocturnal and only get together during the breeding season. (I know some people like that!) Due to their solitary, nocturnal lifestyle, not much is known about their mating habits or about the rearing of their offspring. After a seven month gestation, one young is born (it is rare that they give birth to two), usually in October or November. By six months of age, the young aardvark is capable of finding its own food and will leave its mother to dig its own burrow. – Aardvarks live throughout Africa, mostly south of the Sahara Desert. – The aardvark is admired in African folklore because of its diligent search for food and its lack of fear of soldier ants. 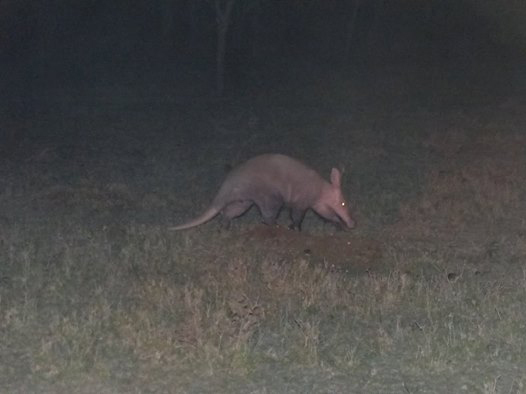 The Maasai tribe believe sighting an aardvark brings good fortune. 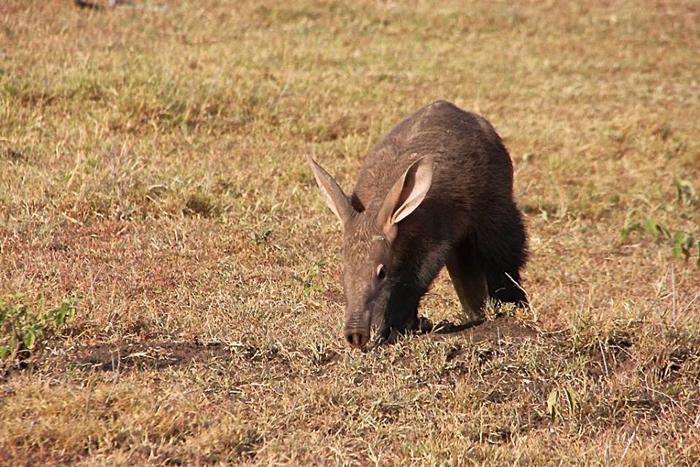 Aardvarks have been seen by guests at all our Porini Camps (Porini Amboseli Camp in Selenkay-Amboseli, Porini Rhino Camp in Ol Pejeta Conservancy, Porini Mara Camp in Ol Kinyei and Porini Lion Camp in Olare Motroogi Conservany in the Mara). There you have it, wishing you good fortune! Porini Camps are small, rustic eco-camps in private conservancies within the Maasai Mara, Laikipia and Amboseli ecosystems, Kenya. Our camps are situated on lands leased from local communities and are staffed by local people, making your holiday with Porini a truly meaningful experience for all concerned.